It seems that the more 52 week money challenge charts that I create, the more requests that I get for variations that meet the specific needs of the person who requests it. This makes perfect sense. If you decide to do one of these challenges, one of the most important aspects is to make sure that the challenge is set up in such a way that you feel comfortable that you can not only succeed, but you’ll also thrive while achieving the goal. The more personalized you can make the challenge to fit your particular circumstances and your personality, the better the chances that you’ll succeed at the challenge. With that in mind, I decided to create a blank 52 week money challenge chart so that you can customize it any way that you want. 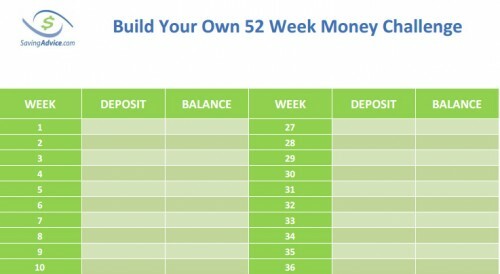 It’s the exact same chart as the 52 week alternate money challenge chart, but we simply left the 52 spots at the bottom blank so that you can fill them in with whatever amounts you want that makes the most sense for you. Once you have filled in those 52 spaces with amounts of your choosing, you’ll approach the challenge the exact same way as you would any of the other ones. Each week you choose one number to cross off from the bottom, and add that amount into your savings account. The goal should always be to try to cross off the highest amount still available at the bottom, but there will certainly be life events that happen during the course of the year which will prevent you from doing so. When those occasions occur, cross off the highest amount that you possibly can, and continue on with the challenge until all the numbers are crossed off. How much you’ll save will depend on what amounts you place into the spaces below. More than anything else, this gives you a good amount of flexibility in determining how to do the challenge, and what the optimal amount is for you to strive to save during the year. Even though most people focus on the amount to be saved, I firmly believe that this isn’t the most important aspect of this challenge. To me, the most important part of the challenge is getting into the habit of actually saving some amount of money every single week. It takes awhile to establish a habit like this, but once that habit is established, you’ll be in a position to save as much as you want. The important thing that this challenge does is that it gets you to the point where saving each week becomes a habit. Once that habit is formed, you will be in a much better financial position regardless of how much or little you saved as part of the challenge. 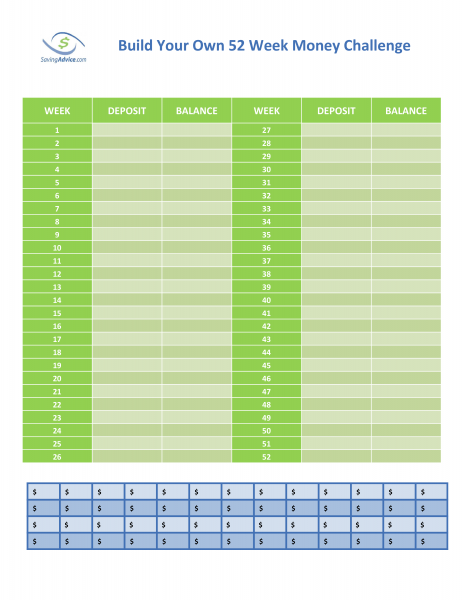 We hope that by giving you this blank printable chart, you’re able to customize it in such a way that you maximize the chance of succeeding with the 52-week money challenge. Ultimately, that’s the goal, and the only thing that truly matters is that the challenge you create is the one that’s best for you. Saving challenges are great because they help you make a conscious effort to save some cash. However, the effort saving money takes is where many people fall short. That is where your smartphone can really come in handy. Digit.co is a smartphone app that makes saving money easy. The app analyzes your savings account balances and automatically sweeps money into savings for you. Once you’ve installed and activated Digit the app does all the work for you. Check it out at digit.co.